Guardian Hunter: SuperBrawlRPG APK 2.0.6.00 is one of popular hunter game among thousand gamers in the world. The game that can be downloaded free provided the experience to fight against various monsters while travelling wonderful world. The gamers will allow to catch the monsters and to make them become loyal guards. Other than fighting against the monsters, you will be asked to do different tasks in various locations such as exploring the dungeons. You can even develop the character you have by learning new skills in order to get higher level. 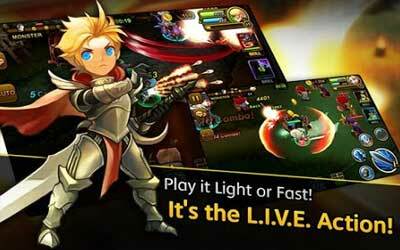 This Android game also provides equipment and great weapon for character. There is even five versus five formats which allow fighting other players in arena. There is an area called Mysterious Astanian Temple. In this location you can explore it and find new allies and enemies as well. Now you can be a hunter to participate in Superbrawl. The game also offers the feature of weapon gem system. You can be stronger than others by having this gem on your equipment. You need to add it in order to get stronger equipment. You can decide the strongest guild in guild war to higher up your reputation and honor. The character of guardian hunter game can also be upgraded for character progression. You will need an internet connection to be able to play this hunter game. It could be said that this game is the combination of adventure and battle game. You can play it as much as you like lightly or fast. You will be able to get experience of endless battles in infinite arenas or dungeon. The players need to kill the boss for the best struggle. Guardian Hunter: SuperBrawlRPG for Android gives you no time to rest since what you need to play is to battle and battle.